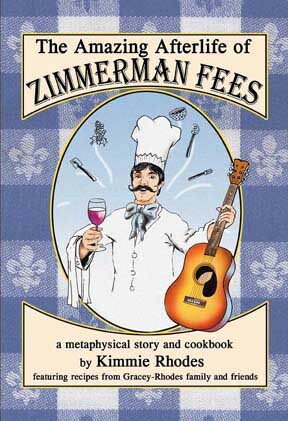 Kimmie suprises us again, this time with a novel-length story about one Zimmerman Fees as he makes his way through his afterlife adventures. Woven into the tale are over eighty recipes by Joe Gracey (the enchilada recipe is featured in the April/May issue of Saveur Magazine) and Kimmie as well as friends and family. 140 pages long, full of wacky side-trips, intriguing characters and soulful cooking. This is a facet of Kimmie Rhodes that we have not seen before. If you like her songs, we think you will like her tales too.